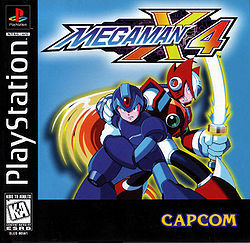 Mega Man X4, known as Rockman X4 (ロックマンX4, Rockman X4?) in Japan, is a video game developed by Capcom. It is the fourth game in the Mega Man X series. The Sega Saturn and PlayStation versions were released simultaneously in Japan on August 1, 1997. A North America release followed in September, while Europe received only the PlayStation version on October 13, 1997. A Windows version was released worldwide in 1998. The plot for Mega Man X4 is presented by both fully-animated full motion video (FMV) cutscenes and in-game text. The storyline differs slightly depending on whether the player chooses Mega Man X or Zero. Taking place in an ambiguous year in the 22nd century (21XX) and following the third defeat of the "Maverick" robot Sigma, Cain Labs issues an initiative to create a supplementary military force to complement the "Maverick Hunters". The army, called the "Repliforce", is a strict regime led by General and his second-in-command, Colonel. Six months following the inception of the group, Cain Labs finds its methods to be ineffective, questionable, and potentially dangerous in the Maverick defense. To make matters worse, behind the scenes, General has been meeting with a mysterious figure who plots the Hunters' demise, insinuating that they are a significant threat to the jurisdiction of the Maverick Hunters. Mayhem breaks out when the Sky Lagoon, a massive floating city, is sent crashing down onto the city below it, killing millions of civilians, humans and Reploids alike. The game begins here where either X or Zero is dispatched to investigate possible causes of the disaster only to become entangled, once again, in a struggle against Sigma to save the world. This page was last edited on 30 May 2016, at 13:22.